Just a week after Kotaku’s explosive report on the troubled development of Anthem, it’s published a follow-up investigation on the next Dragon Age game. And while BioWare and EA teased what’s almost certainly Dragon Age 4 at the Game Awards in December, Kotaku’s reporting indicates it’s a completely rebooted vision. The original Dragon Age 4 was scuttled, and the sad thing is, it sounds amazing. 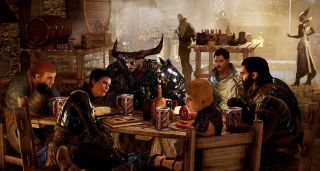 According to Kotaku’s report, the original version of Dragon Age 4 was codenamed Joplin, and was ramping up into the pre-production phase at BioWare in 2015 following the launch of Inquisition’s final expansion, Trespasser. Dragon Age veterans Mark Darrah and Mike Laidlaw began working on concepts for the sequel, taking with them lessons learned from what sounds like a brutal production schedule of Inquisition. The concepts that emerged initially sound exciting. The idea was that the game would center on spies working in Thedas’ oldest human nation, Tevinter Imperium. In the Dragon Age fiction, it’s a country ruled by a council of mages, headed up by an Imperial Archon. According to the new report, gameplay was meant to be reactive and emergent, with action sequences called “heists” making up a sizeable amount of the action. A central idea was for the world to genuinely react to players’ choices. The developers wanted to build “systemic narrative mechanics,” or a way for the game to build a coherent story around the choices you make in the game. That may be one reason that in 2017 BioWare brought in Alexis Kennedy, the founder of Failbetter Games and the writer behind Sunless Sea and Fallen London. Kennedy’s games, including the recent Cultist Simulator, let players weave together bits and pieces of story and lore into narratives based almost entirely on choices. It was an ambitious and compelling vision, and one that former BioWare developers told Kotaku were “some of the best work experiences” they’d had in the industry. But in October 2017, says the report, BioWare and EA cancelled the project.